On Monday Bakiyev made his first public appearance since he fled the capital Bishkek, at a rally organized by his supporters in his native village in the south of the country. 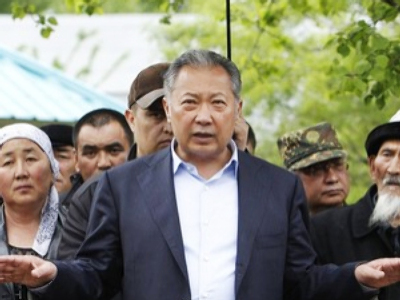 The first deputy prime minister of the takeover government, Almazbek Atambayev, said that a special operation to detain Bakiyev is being prepared, however, he stressed that the new administration wants to find a “bloodless” solution. Appearing at the rally, Bakiyev said that he believes that people in the south of the country are on his side and they are ready to launch actions to support their president. "Many people wish to back me. My supporters plan to stage an action in the towns of Jalal-Abad and Osh," Bakiyev is quoted as saying by the 24.kg news agency. According to Interfax news agency, about a thousand of Bakieyev’s supporters, mostly middle-aged people and women have gathered at the rally on Monday, chanting “Bakiyev is our president.” Bakiyev told journalists that because of the rain, fewer people were able to come, and promised that the “big rally” will be held on Tuesday. Atambayev also said that the new government does not recognize the legitimacy of President Kurmanbek Bakiyev. “No one elected Bakiyev,” said Almazbek Atambayev, who lost in the presidential elections in July 2009. He has pointed to the OSCE report which stated that the 2009 presidential elections in Kyrgyzstan did not meet international standards. He blamed Bakiyev for ordering the shooting of innocent people and thus “put himself outside the law,” adding that the Kyrgyz government is ready to prosecute everyone who is involved in any crimes. Meanwhile the OSCE has urged the interim government to hold talks with President Bakiyev, as the envoy of OSCE Chairman Zhanybek Karibzhanov did not exclude the possibility that the organization could act as a mediator between the conflicting sides. "The matter must be discussed. We are discussing the issue of talks between the two conflicting sides with the leadership of the provisional government, and we know that it is ready for talks and the first contacts have taken place," envoy to the OSCE , Zhanybek Karibzhanov, told the press, noting that the representatives of the interim government already made first attempts at negotiating with Bakiyev. Meanwhile, Bakiyev said that he still considers himself to be president of the country, and is ready to come to Bishkek to hold talks with the opposition. Commenting on Bakiyev’s possible return to the capital, the head of the interim government, Roza Otunbayeva, said that she can not guarantee Bakiyev’s safety, in case some of the killed demonstrator’s relatives try to take revenge over their losses. According to some media reports, the new government is not planning to call a special parliamentary session to impeach Bakiyev, stressing that Bakiyev “still has a chance to flee the country…Bakiyev has reached a moral impasse, and now he is asking: what shall I get in exchange?" Otunbayeva stressed the provisional government was now discussing the problem. "The isolation of Bakiyev is going on. He can do nothing," she stressed. She has also confirmed that the interim government has initiated criminal cases against those, who allegedly ordered to open fire on demonstrators. Among those on the wanted list are Bakiyev’s close relatives: his son Marat Bakiyev and brother Zhanysh Bakiyev, acting Prosecutor-General Baitemir Ibrayev told the local news agency Kabar on Monday. 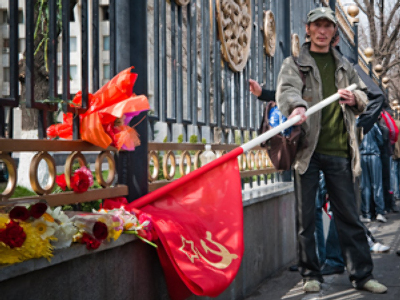 "They were charged in absentia with killing two and more people in the organized group under Article 97 of Kyrgyzstan's Criminal Code," said Ibrayev. 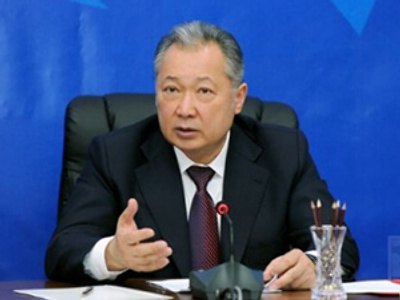 On Tuesday the interim government stripped Kurmanbek Bakiyev of presidential immunity. The government says they will arrest the president if he does not arrive at the country’s capital on Tuesday. The fate of US Manas airbase is shaky? The country’s new authorities said they plan to respect all prior international agreements except for those reached earlier with the use of corruption schemes. That is according to the First Deputy Head of the provisional government Almazbek Atambayev. However, he said that the fate of the American airbase Manas will be reconsidered. “We will comply will all international agreements, but we will see what to do with Manas (the US airbase in the Bishkek airport)," he said. "Moreover, next year the United States plans to end its operation in Afghanistan. But all issues will be resolved in a civilized way during a dialogue with the US authorities." Atambayev has also expressed disappointment with Washington’s stance on the recent events in Kazakhstan, accusing the US of supporting Bakiyev’s regime. However, Robert Blake, US Undersecretary for Central and South Asia, said at Monday’s press-briefing that the US is satisfied by the new Kyrgyz authorities’ promises, concerning the “Manas” air base. That’s according to RIA Novosti news agency. “This is good news that Roza Otunbaeva [head of the Interim Government] said that the authorities would continue to follow the agreements concluded earlier. Of course, the US is ready to start negotiations on the details with her and other members of the Interim Government at any time,” he said. The US military command claimed at the end of last week that the US temporarily stopped all use of transit center “Manas” in the international airport Bishkek. On Monday the US embassy in Bishkek said that the transit center had resumed operation. 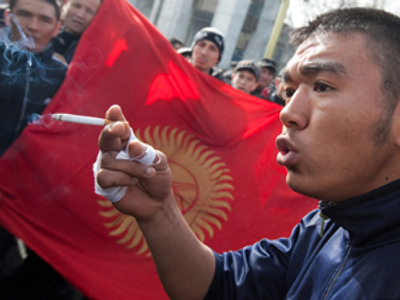 The new authorities said that over the next six months they are planning to make Kyrgyzstan a parliamentary republic. "Kyrgyzstan will be a parliamentary republic," interim deputy head Omurbek Tekebayev told Interfax, stressing that the interim government will leave behind the previous system where "the winner takes everything," and is offering a new one whereby "the winner must not take everything." Tekebayev also stressed that within in the next half a year the new government plans to change the republic’s Constitution, the election law, to form a new Central Election Commission and to hold parliamentary and presidential elections, and thus legalize the new power. In 2005, Akayev had to flee the country after being overthrown in the so-called “Tulip Revolution”. He was replaced by Bakiyev, and was accused of nepotism, corruption and a lack of democracy in the country – practically the same things Bakiyev is now being accused of.